Sandy Straits and Beyond: This and That! This post shows a mixture of birds photographed over several weeks. I have had the flu and haven't been well enough to go and look for interesting birds. This first bird is a Scaley-breasted Lorikeet. It is only the second time I have seen these birds in my yard and this one was a lucky chance! 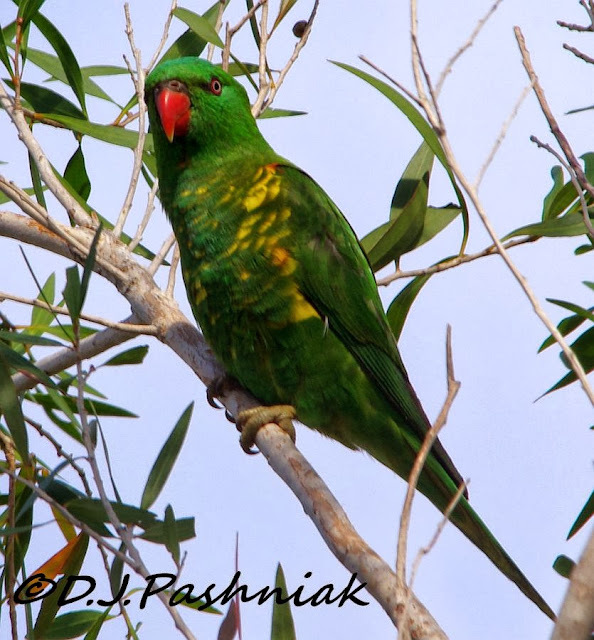 I heard Rainbow Lorikeets in my callistemon trees and when I went out with my camera I also saw a couple of Scaley-breasted Lorikeets. They are a little smaller than the Rainbow Lorikeets and a bit quieter - but just as hard to photograph among the leaves. This bird is not such a good find. 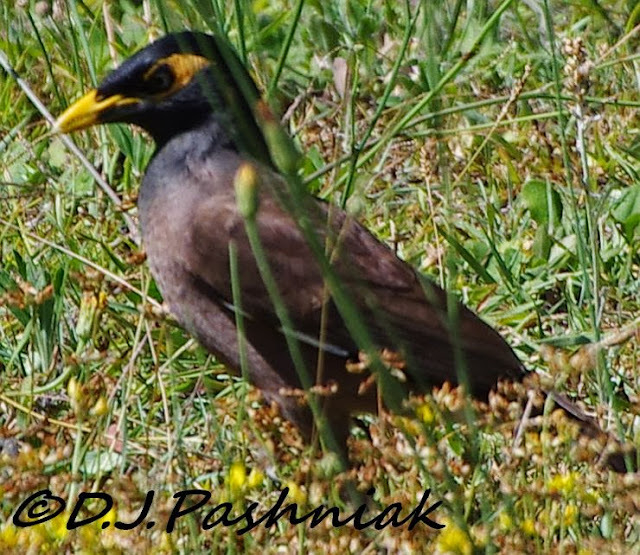 It is a Common Myna (Acridotheres tristis). These birds were brought in to Australia back in the 1860's. At first they spread through the cities but then started taking over country areas. The trouble is that they displace native birds and small mammals. They compete for nesting hollows in trees and usually win! We have not had them here where I live until very recently and this bird was one of a pair that came into my back yard last week. I opened the door and took a couple of quick pictures but when I tried to get closer both birds quickly took off. I photographed this third bird out at Inskip the other morning. (It was a beautiful morning but unfortunately I came home and had to go back to bed! I wish this flu would go quickly!) While I was watching, it dragged itself up on the sand and sat there apparently exhausted. It is a Shearwater but I am not sure beyond that exactly which kind it is. There have been numbers of recent reports of Shearwaters found dead and dying on the beaches in NSW and southern Qld. The birding New Zealand forum also has been reporting dead and dying birds over there. I can only imagine how many birds are dead if they are reported from both Australia and New Zealand! It is not known yet if the birds are dying from an extreme weather event or if they are starving because the fish are not around. Many people are saying that the oceans are being over-fished and it may already be too late to reverse the trend. This article is written by a yachtsman and tells of what they found on a recent trip from Australia to Japan and then over to the USA. He titled his article "The Ocean Is Broken" and gives quite horrible details. It is not a good outlook for any of our oceans! For more photos of birds visit Wild Bird Wednesday. Get well soon Mick, however your bits n bobs make for a great post. 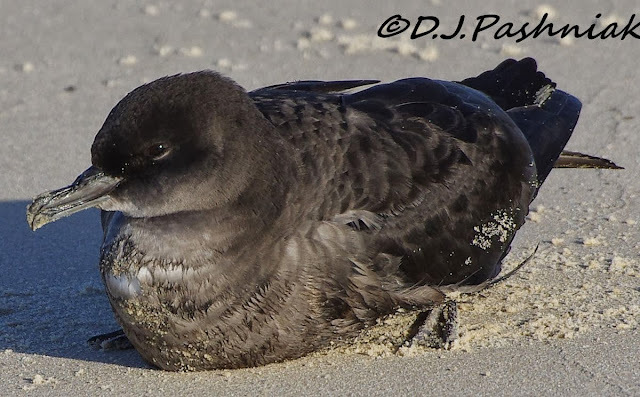 I hope you get a positive ID on the shearwater. I hope you feel better soon... and thanks for the link to the article... our wildlife have a big fight on their hands. Its not hard to be quieter than a rainbow lorikeet! Can't bring myself to read the ocean articles yet this early in the morning... It would have been sad seeing the shearwater. It looks very beautiful in the photo. Sorry to hear you haven't been well. The lorikeet is a gorgeous bird. great snaps; glad you're over the flu now. The scaly is great to see so close and also the shearwater; fabulous! sorry about the shearwater deaths. and sorry you've been ill yourself! the lorikeet is amazing! Great captures of the Scaley Breasted Lorikeets. It must be nice that they are a little quieter than the Rainbow Lorikeets too. Hope you stay well from now on. Hope you're feeling better and better by the day, Mick!!! Your birds are beautiful....tho a sad story of the shearwater. HI Mick I hope you get over the flu quickly but you might find you are a bit weak for sometime if you have had the full blown flu. great birds shown today especially the Shearwater. It is disturbing to know that a lot of of oceon birds are dying. The lorikeet is such a perfect match for its environment that I'm not surprised it can "vanish" so easily. The shearwater looks out of place like that - as you observe it should be searching the oceans for food and it's awful what us humans are doing to the planet. Well, I'd say these are pretty interesting birds! Hope you are feeling better. I am so sorry to hear you had the flu. It can be really horrible. I like the photographs you took. The birds are really beautiful and full of nice colors. there was lots of Mynas in honolulu as well. Large numbers all over the island. The lorikeet is stunning! What luck to have them in your backyard. Sure hope you're feeling all well soon. Hope you're feeling better! Lovely shots of the birds. Hi Mick... The second shot of the Lorikeet is a cute one! It is a real shame , and shame on mankind for what ends up in the ocean, such beauty that is just not valued enough to notice until something goes array!! Do hope you are feeling better...me I have a infection under one of my teeth grrr!! Stop being sick! That's no fun! Love your photographs and the article is informative and timely. It's going to take each one of us to make a change for the better regarding the environment. Thanks so much for sharing your birds, Mick! Shearwater waters are hard to identify at all times. I hope you are over the flu now! How sad that the myna is displacing other birds. Sadly, humans have introduced invasive species all over the world. Humans are NOT as smart as we like to tell each other we are. 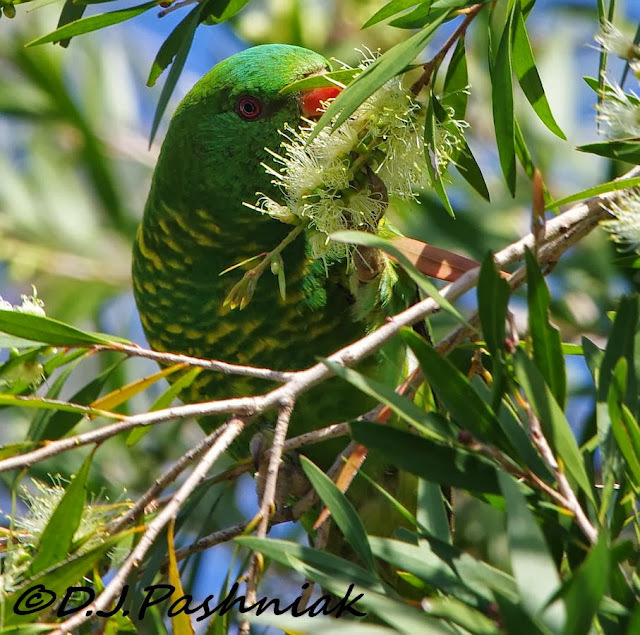 Thanks so much for your comments on my blog..I love your Lorikeet photos...cheers. The Lorikeets are beautiful! Great collection of birds and photos. Great shots, Mick! I do love Scaly-breasted Lorikeets. My oldest daughter had one as a pet. He was very cheeky! I've never seen a Shearwater. It's another on my list.